The train from Dijon to Avignon takes us through vineyard country. Signs for M.Chapoutieradorn the hillsides. 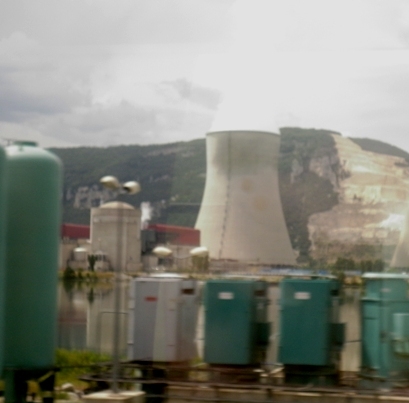 As you enjoy the scenic vignettes, you pass an ominous brooding nuclear reactor, no doubt waiting for the Rhone to flood and irradiate the already powerful reds. A first impression of Avignon is that it is noticeably more touristy than Dijon and more English language friendly. For example, unlike Dijon, many of the restaurant menus here feature English translations. 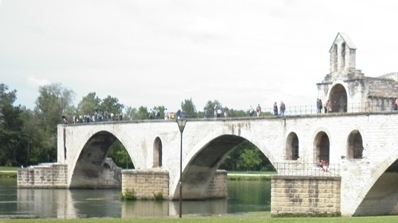 A must-see here is the Pont d’Avignon, originating from the 12thcentury and the basis of the famous song. It’s actually less than half a bridge as only four of the original 22 arches remain, so it stops disappointingly half way across the river. They have had many centuries to fix this but so far no action. And I have it on good authority that the song we learned in execrable French at school is wrong – they didn’t dance “sur la pont”, they actually danced under it, that is, “sous le pont”, in a long gone café. Should I be called upon to sing this song in future it is the correct “sous” version I shall offer.